The synergy that is created between our organizations is what leads to solid award-winning work. 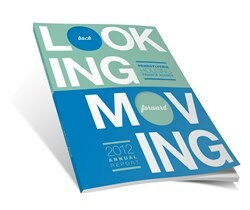 Graphcom Creative, a full-service marketing and creative firm, and division of Gettysburg-based Graphcom, Inc., was awarded a gold Hermes Creative Award for their work on the Pennsylvania Housing Finance Agency (PHFA) 2012 Annual Report “Looking Back, Moving Forward.” The piece was designed by Graphcom Creative and printed and mailed by Graphcom, Inc.
“The synergy that is created between our organizations is what leads to solid award-winning work. We owe a lot to PHFA, not only for allowing us the freedom to stretch our creative wings, but also for the amazing service that they perform for their clients day in and day out. Our job is even more fulfilling because of it and we are always excited to get the opportunity to work with them,” said Creative Director Troy Dean. The Hermes Creative Awards is an international competition for creative professionals involved in the concept, writing and design of traditional materials and programs, and emerging technologies. Entries come from corporate marketing and communications departments, advertising agencies, PR firms, graphic design shops, production companies, web and digital creators, and freelancers. Graphcom Creative was established in 2009 by Troy and Jessica Dean, lifelong residents of Adams County and owners of Celebrate Gettysburg magazine. Its services cover the following areas: print design, web design and development, email marketing, SEO consultation, mobile app development, copywriting, photography and public relations services. Graphcom, Inc., founded in 1982, is a full-service communications and marketing firm located in Gettysburg, Pa. The organization includes a creative and interactive agency (Graphcom Creative), a signage division (Signs by Graphcom), a publishing division (Graphcom Publishing), a digital flags and scenic effects division (Field and Floor FX), as well as a full-service commercial printing division with G7 Master Printer certification.